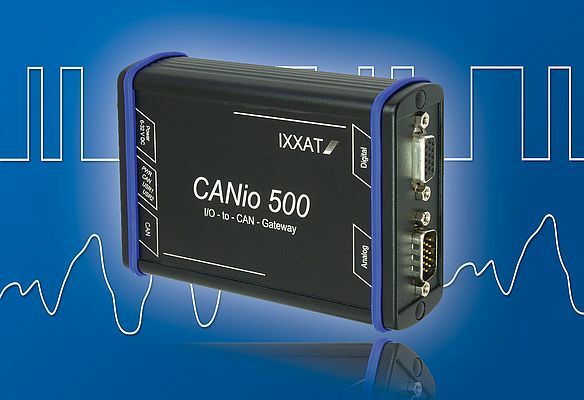 With its CANio 500, IXXAT offers a flexible I/O gateway for the easy and quick connection of analog and digital I/O signals to CAN and CANopen systems. Key features of the device are the inputs and outputs for digital and analog signals, which can be configured flexibly. The device has four analog inputs and outputs each with a 12 bit resolution. The analog inputs are available with different voltage ranges as well as with differential input circuits or current inputs. The output voltage range can be programmed individually for each analog output in a ± 10 V working range. Moreover, the device has four digital inputs and outputs each. The output voltage range can be freely selected in a wide range; the inputs’ switching threshold automatically adjusts itself to the selected voltage range; and the outputs are short circuit protected. Therefore, the device is designed as a self-starting CANopen slave, with all important parameters, such as Node-ID or sampling rates for the analog inputs, stored as default values on board. Since this enables immediate operation directly after start up without further settings, the device is also suitable for CAN systems. It can be customized for different applications either with the included configuration software, or by uploading the configuration data via a CANopen master. In a single unit, the CANio 500 combines various I/O functions which up until now required several devices. Due to its 6 to 32 V power supply range, robust aluminum housing and -40 to 70 °C temperature range, the device is suitable for mobile applications. It is also available in DIN rail housing.